I am sometimes asked about the ‘Flatpack Movement’ and I struggle to explain the concept. 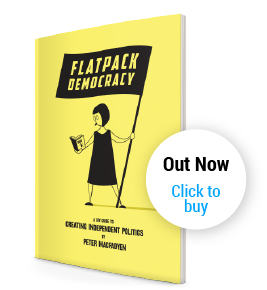 The Flatpack tag comes – obviously – from Flatpack Democracy, the title of the book I wrote which set out to show how the independents took power in Frome and to provide some simple steps for others to do the same at a local level. It’s the story of what we did in Frome, and now, making a list of the further 10 or so groups who have done the same, has given some clarity to my thinking. As well as the 10 groups I know where independents hold power, there are another five who hold some seats, and a further 35 places that we know of where a group is clearly working in that direction. To a lesser or greater extent these have used the ideas expressed in Flatpack Democracy in some way. There is an actual ‘Flatpack Party’ in Belgium alongside two other groups there well engaged with the principles and interestingly it was a Belgian who talked about ‘Flatpackery’ – a comment on many things as well as his fine grasp of English! There are another 3000 ish copies of the book out there doing who knows what. As well as the groups mentioned earlier there are another seven I know of who are, in effect, local parties. However, the one thing they all have in common is their rejection of Party Politics. 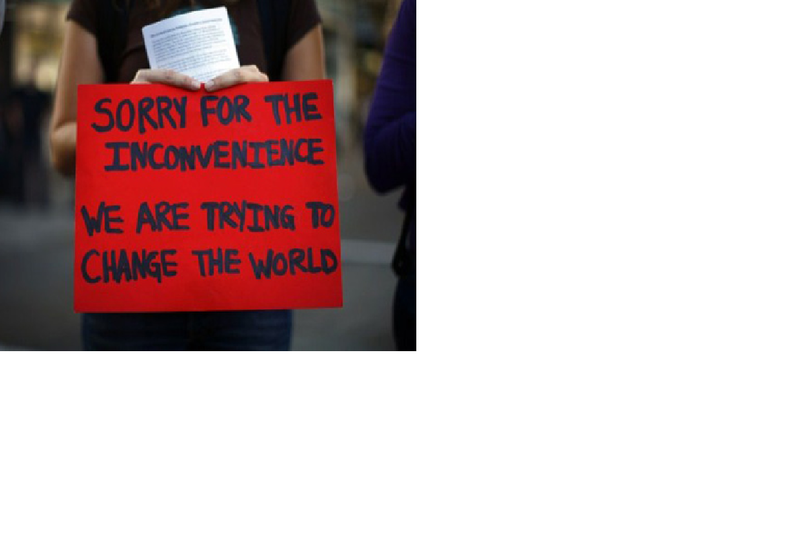 If that alone were enough to define them as a Movement, then perhaps they are. However, for me personally there must be something much more significant: It is not merely enough for a group of individuals to move aside another group (who were elected as members coming from a particular Party) if they do not then go on to create a radical and effective council. There needs to be a fundamental change to the way in which local government is conducted. A change in the relationship between council and people, a clear move from representation to participation and an upsurge in ambition and productivity at a community level. In the past these factors were not as crucial as services were handed down from central or regional government, but as this has all changed under the cloak of austerity it becomes crucial that effective local government plays its part in a vibrant community. To achieve this kind of change, I believe councillors need to adopt new ways of working which step outside the paradigm of the confrontational, ya boo politics that sadly is the norm in the UK. A confrontation that is often extended from council chamber to the relationship with the community. At the core of this lies a power relationship which needs to change alongside a repositioning of councils so that they become just one player amongst many in the multilayered ecology of a community. In looking at the list of places where new style councils are emerging, I realise some are on the course I outline above and others are not. For me, a group of places where new people have been elected does not make a Movement. If they then go on to catalyse deep and fundamental change in the way politics works and in what is achieved at a local level, we can really begin to talk about a Movement and the power of Flatpackery. I also recognize your struggle to explain the principles to people. Luckily we already have a group of citizens devoted to those principles and fully understanding them. So, for the coming year our mission is to point them out to the rest of our 11.180 citizens. Already some other towns are asking us for enlightment and to come and help them install “Flatpackery” in their town. We love it! “Flatpackery” and democracy in Belgium started in Grobbendonk and will bring back the power to the people. I’m sure. The train has started and will not be stopped. I would love to sit down with you and compare notes, some day. I’m sure we can learn more and better ways to achieve real democracy by talking and making a democratic network. I have contacts with some other movements and there are ideas to move “Flatpack Democracy” to a higher level. Not easy when the scale goes bigger but democracy should not be stopped by scale. Nothing is impossible with the combined power of enough intelligences working for the same goal. Many thanks for the email below (in answer to my blog). How fascinating and exactly the kind of Movement that I seek in response to my slightly disheartened blog – my realisation that taking power alone does not mean much. So, as your non-Party develops I’d be really interested to see the reaction and in particular how you are able to interact with the other groups within the town who play key roles, but are also not politicians. For example any civil society organisation providing services – I’m increasingly interested in how the Council can start to place itself in a new position with these groups – as an ally, a supporter, a catalyst and genuine partner, without the usual power dynamics. Incidentally, the ‘Flatpack Party’ i was thinking of was the work of Thomas Goorden who i think is ex-Pirate party, and with whom I spent some time in Amsterdam before he returned to Antwerp….. but I have lost touch with him and it may be that his initiative has not yet taken fruit. Ms Vos -it would be useful if your website could have an English translation to see what you are all up to over there, yes that would be relevant to the debates in the UK and elsewhere in the world. Hope you can consider this. Of course we will consider this. For the moment we are in a partycracy war here in Grobbendonk since “the powers that be” have a lot to lose, it seems. Even in a small town, 11.180 residents, like ours. We try to communicate only with Citizens and have a positive Flatpack story to tell them. We also have some interviews and films we made, in dutch. I already asked someone to see if we can put english subtitles on them. So, please be patient, we’re working on it. In the mean time, in dutch, some links. A television news video 12 september 2017 when we went public. We’ll try our best to have translations for the above items as soon as possible.